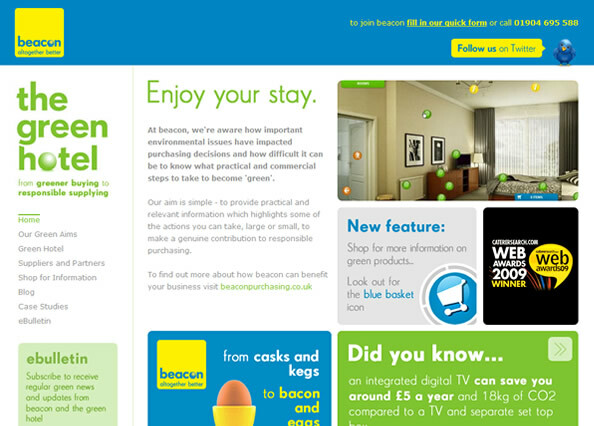 We’ve been working with beacon since the new year, on giving their beacon green hotel website a refresh. Their users and customers have been enjoying the fantastic virtual hotel we helped them build last year, and they’ve decided to implement some fantastic new functionality to help customers and suppliers see just how environmental products can find their way into a hotel. The hotel now features an easier way to navigate around the various rooms, through the implementation of a drop-down which allows users to instantly jump to individual rooms. This decreases the time it takes for users to travel through the hotel. We’ve also implemented a new icon system, making it easier for users to distinguish between information and product points. There’s also a new system in place which informs users when new products have been added, making it easier for users to find out information that is being added to the hotel directly from beacon. As well as improvements to the virtual hotel, we’ve made a number of improvements to the website itself, including a revised navigation system, and a number of advertisements for the beacon purchasing service. We’ve also given beacon a much improved blog, allowing them to use the WordPress platform to keep readers updated on what’s going on at beacon and the world of green products. We’ll be working closely with beacon throughout the year on a number of projects, so keep an eye on our blog for more news.